Researchers at the Department of Energy's Lawrence Berkeley National Laboratory (Berkeley Lab) have demonstrated for the first time that dark fiber - the massive network of unused fiber-optic cables installed all over the country and the world - can be used as sensors for detecting earthquakes, changes in permafrost conditions, the presence of groundwater, and a variety of other subsurface activity. In a pair of newly published papers, a team led by Berkeley Lab Researcher Jonathan Ajo-Franklin reported they had successfully integrated a technology called "distributed acoustic sensing," which measures seismic waves using fiber-optic cables, with innovative processing methods to allow consistent seismic monitoring, attaining results comparable to what conventional seismometers can measure. This has huge potential because you can just imagine long stretches of fibers being turned into a massive seismic network. The idea is that by using fiber that can be buried underground for a long time, we can transform traffic noise or other ambient vibrations into usable seismic signals that can help us to monitor near-surface changes such as permafrost thaw and groundwater-level fluctuations. Dou is the main author of "Distributed Acoustic Sensing for Seismic Monitoring of the Near Surface: A Traffic-Noise Interferometry Case Study," which was published in September in Nature's Scientific Reports and corroborated the method for monitoring the Earth's near surface. More recently, Ajo-Franklin's group published a follow-up study guided by UC Berkeley Graduate Student Nate Lindsey, "Fiber-Optic Network Observations of Earthquake Wavefields," in Geophysical Research Letters (GRL), which shows the viability of using fiber-optic cables for earthquake detection. Dark fiber is basically unused fiber-optic cable, of which there is a glut on account of a massive rush to set up the cable in the early 1990s by telecommunications companies. By the time the cables were buried underground, the technology for conveying data upgraded considerably so that fewer cables were necessary. There are, at present, dense corridors of dark fiber crisscrossing the whole country. Distributed acoustic sensing (DAS) is an innovative technology that measures seismic wavefields by shooting short laser pulses across the fiber’s length. The basic idea is, the laser light gets scattered by tiny impurities in the fiber. When fiber is deformed, we will see distortions in the backscattered light, and from these distortions, we can measure how the fiber itself is being squeezed or pulled. Using a test array they fitted in Richmond, California - with fiber-optic cable positioned in a shallow L-shaped trench, one leg of roughly 100 m parallel to the road and another perpendicular - the researchers confirmed that they could use seismic waves produced by urban traffic, such as trains and cars, to image and track the mechanical properties of shallow soil layers. The measurements offer information on how "squishy" the soil is at any given point, making it possible to deduce a significant amount of information about the soil properties, such as its texture or water content. "Imagine a slinky - it can compress or wiggle," Ajo-Franklin said. "Those correspond to different ways you can squeeze the soil, and how much energy it takes to reduce its volume or shear it." The neat thing about it is that you're making measurements across each little unit of fiber. All the reflections come back to you. By knowing all of them and knowing how long it takes for a laser light to travel back and forth on the fiber you can back out what's happening at each location. So it's a truly distributed measurement. Having established the concept under regulated conditions, the team said they expect the method to work on a range of current telecommunications networks, and they are presently conducting additional experiments across California to show this. An ongoing study in Alaska is also investigating the same method for tracking the stability of Arctic permafrost. Dou added, "We can monitor the near surface really well by using nothing but traffic noise. It could be fluctuations in groundwater levels, or changes that could provide early warnings for a variety of geohazards such as permafrost thaw, sinkhole formation, and landslides." Building on five years of Berkeley Lab-led research exploring the application of DAS for subsurface monitoring using non-earthquake seismic sources, Ajo-Franklin's team has at present pushed the limit and has demonstrated that DAS is a robust tool for earthquake monitoring as well. In the GRL study led by Lindsey in partnership with Stanford Graduate Student Eileen Martin, the research team conducted measurements using the DAS method on fiber-optic arrays in three locations - two in California and one in Alaska. In all cases, DAS was seen to be comparably sensitive to earthquakes as conventional seismometers, regardless of its higher noise levels. Using the DAS arrays, they put together a catalog of regional, local and distant earthquakes and showed that processing methods could exploit DAS' many channels to help comprehend where earthquakes begin. Ajo-Franklin said that dark fiber has the plus point of being virtually ubiquitous, whereas traditional seismometers, because they are costly, are sparingly installed, and subsea installations are for the most part scarce. Furthermore, fiber allows for dense spatial sampling, meaning data points are just meters apart, while seismometers usually are separated by many kilometers. Lindsey added, "Fiber has a lot of implications for earthquake detection, location, and early warning. 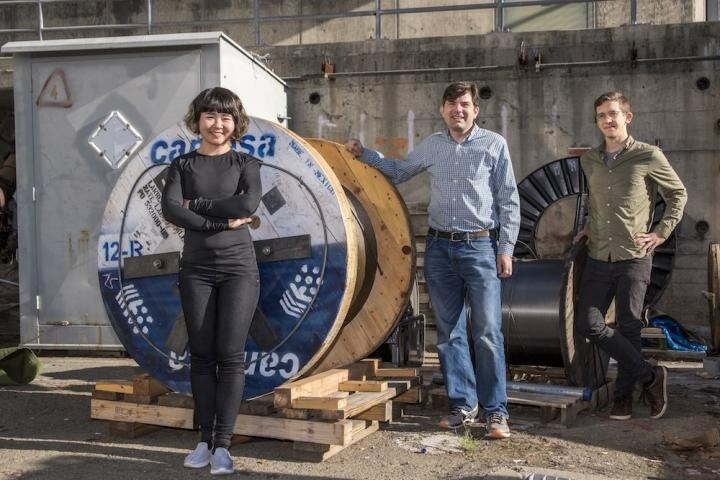 Fiber goes out in the ocean, and it's all over the land, so this technology increases the likelihood that a sensor is near the rupture when an earthquake happens, which translates into finding small events, improved earthquake locations, and extra time for early warning." The GRL paper notes other probable applications of using the dark fiber, including nuclear explosion monitoring, urban seismic hazard analysis, offshore submarine volcano detection, global seismic imaging and micro-earthquake characterization.